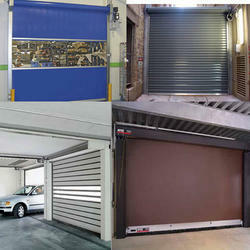 Our product range includes a wide range of automatic garage door, automatic industrial sliding door, automatic industrial sectional door, insulated sectional garage doors, automatic garage doors and automatic aluminium glazed door. Garage Doors are vertically-opening doors constructed using multiple panel sections built to withstand heavy usage using double skinned steel foam filled panels in the main but also aluminium framed and glazed panels for varying degrees of high quality vision. 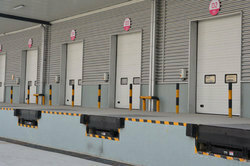 The vertical opening of these doors creates more space in front of and behind the door allowing you to park vehicles closer and utilise more room inside the building. Door uses color-painted panel,internal is filled with high-pressure polyurethane foam or ethylene foam.it has excellent thermal and sound insulation. 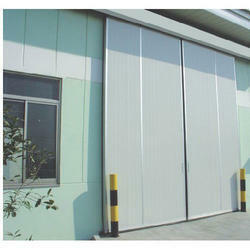 it is dustproof and has good appearance and high strength. Sealed and durable : it uses rubber or brush to seal,the sealing effect is good and it is durable. Flexible and tranquility : no matter the guide rail adopt up-suspension oor down-bearing type,both manual and electrical are flexible and with low noise when opening and closing the door pieces. Prolonged wear-resistance: each door piece had 4 groups of steel guide wheel.the guide wheel is made of 45#round bar,with double-row ball bearing inlayed inside.it has strength,and good wear-resistance. Driving system : the driving system adopts swing door's motor,and matched manual on-off device,it could be operated by line control,remote control,and hand control. 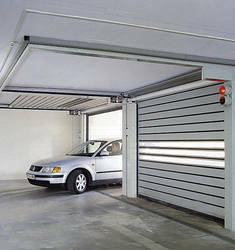 Most sectional garage doors manufactured are now double skinned as standard with foam filled insulated panels ranging between 40mm and 45mm thick, mainly constructed from galvanized steel sections. There are a vast array of smooth or various embossed effects pressed into the outside face of the panel creating very different visual effects. Various high quality standard, bespoke or metallic paint finishes as well as modern laminate wood grain effects have now also become very popular and match or compliment many other building products used on domestic and commercial buildings. The overall integrity and construction of a sectional door provides levels of stability and strength not possible in other door mechanisms. Explore our extensive line of sectional garage doors, from thermal efficiency and extreme durability to architecturally inspired models. Find the right garage door for your building application, including commercial, industrial, agricultural, and loading dock garage doors. 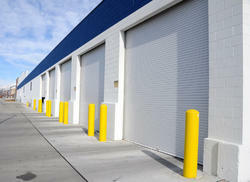 Our company boasts a complete selection of performance- and safety-tested commercial and industrial overhead doors, including rolling-steel garage doors. We manufacture a wide array of styles to meet your business needs, from insulated and non-insulated doors for internal and external applications to high-performance, sectional-steel and fire-rated doors. Engineered for excellence, Overhead Door’s commercial and industrial doors are the premier choice for durability, serviceability and hassle-free performance. 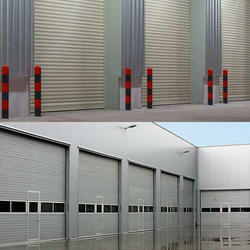 Industrial Sectional Doors Industrial Sectional Doors are vertically-opening doors constructed using multiple panel sections built to withstand heavy usage using double skinned steel foam filled panels in the main but also aluminium framed and glazed panels for varying degrees of high quality vision. The vertical opening of these doors creates more space in front of and behind the door allowing you to park vehicles closer and utilize more room inside the building. 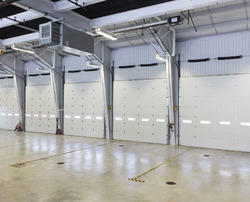 When open, the industrial door sections neatly fold up and lay flat beneath the ceiling. For angled roofs, special tracks can be ordered so that the door panels open in line with the roof and you can even have a sectional door doing straight up the wall vertically if you have the headroom. Manufactured to your specific requirements, each of our industrial sectional doors provide reliable service & exceptional ease of use combined with an outstanding level of access control capable of withstanding high usage volumes to cope with all levels of industrial workloads. 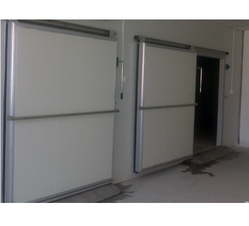 our industrial automatic doors have been designed to perfectly blend in any type of Industry and building, from the very modern to the very classical, without affecting either quality or look. Our doors are fabricated from only the highest quality in a variety of slat profiles, finishes, and options to meet any project requirement. Always designed and constructed to your individual specifications, ease of installation, our doors offer the functionality of undisturbed operation and years of durability.